For the past two months I have been enjoying my first ever print subscription to a scientific journal. The good folks over at Nature Reviews Genetics offered my a small discount that nudged me to it (thank you!). 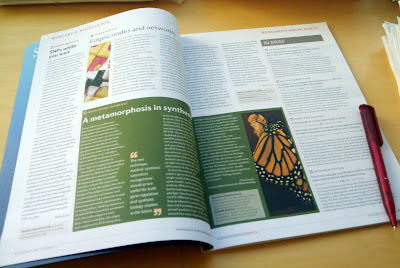 I thought that if I ever tried a print subscription it would be for sure a review journal. I can't say I regret the decision. Having the print issue to read on my commute makes me read articles that I would not normally print out and the front section (research highlights) is a good way to catch up to science news. Maybe this explosion of e-readers will make it easier to emulate the browsing experience of a bound print copy. As Nicholas Carr (and others) have pointed out, changes in internet technology shape the way we think and use information. In a recent post, Carr gives his answer to this year's Edge annual question "How is the Internet changing the way you think?". "My own reading and thinking habits have shifted dramatically since I first logged onto the Web fifteen or so years ago. I now do the bulk of my reading and researching online. And my brain has changed as a result. Even as I’ve become more adept at navigating the rapids of the Net, I have experienced a steady decay in my ability to sustain my attention." I think that Carr is, as usual, exaggerating in his pessimist view of web culture. In my work I scan online and print to read. The difference from that workflow to browsing a bound print copy is only the way I filter what I read. Still, it is worth a thought. Maybe we should be working on technologies that will help us work by forcing us to focus our attention better. For now, a print out will do :).